A crowd gathered outside Pride Toronto on Berkeley Street Saturday to protest the organization’s decision to invite uniformed Toronto police officers to march in the 2019 parade. Two years ago, Black Lives Matter Toronto (BLMTO) stopped the Toronto Pride march and presented its organizers with a list of demands, one of which was to stop uniformed police from being allowed to participate in the parade. 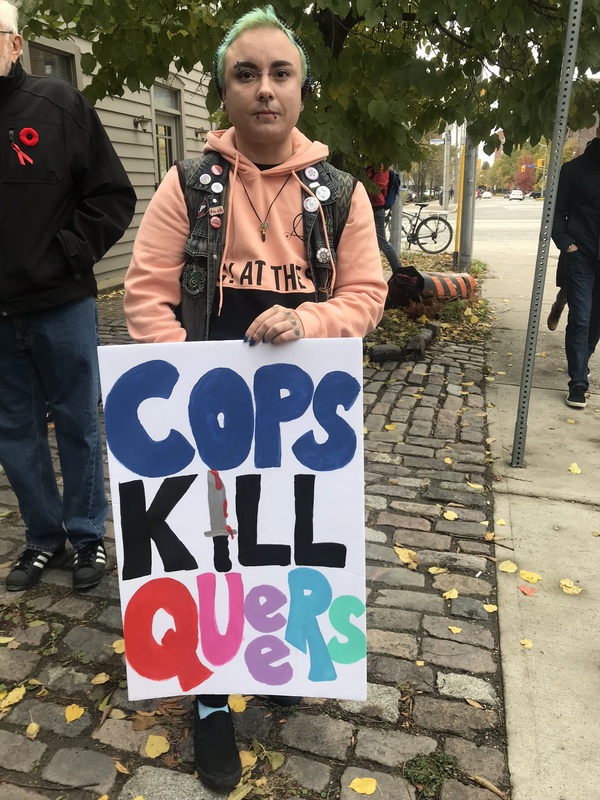 They said having police march in the parade amounted to disregarding the brutality that the LGBTQ2S community has experienced at the hands of law enforcement. Alfonso King, a DJ and performer known as DJ Relentless, addressed the crowd, many of whom clutched coffee cups with mittened hands. He spoke about his experience as a black, gay, HIV positive man in Toronto. He said that while he’s not an official member of BLMTO, he supports what they did in 2016. “I’m tired of white gay men telling me how I should feel about pride,” said King. Kinsman says that BLMTO’s 2016 protest recaptured the spirit of Stonewall, a reference to violent demonstrations in New York City in 1969 that followed police raids on the gay community.